Fine review Johann, I will put this on my to see list. Alan Bennett is such an icon in Britain that everyone wants to have an Alan Bennett story (he has sort of succeeded Harold Pinter in that role). Stephen Fry’s was that he auditioned in front of him for a play and it made him so nervous that he did badly. When he explained why they had a second audition in which Fry did well without Bennett there. And then Bennett crawled out from his position on the ground between the seats where he had hidden so that Fry would not be nervous but he could still hear him do the part. My own is much more boring, being one table over in a London club, thinking of saying hello and then thinking that were I so famous I would hate to have strangers bothering me. As always, I let the latter impulse guide me. I had heard a few times that Bennett was an incorrigibly rude man, but I have no celebrity exposure to substantiate that assessment. After reading this interview , my opinion of him changed in a rather more positive direction. Since I’ve been a Netflix subscriber, once and only once have I watched a film on one of their CD’s and then watched it again the next day, start to finish. The film was this one. I love it desperately, and will probably order it up again, since it’s been a couple of years now since I saw it. Film versions of plays almost never work, largely because plays are all talk, and movies based on them tend to be all talk too. I guess it’s because, as you say, the talk is so good, that limitation seems to melt away in this movie. I endorse everything you say in your review, and would emphasize the magnificent performances of practically everyone on screen. Particularly affecting is Samuel Barnett as Posner, the Jewish gay kid (and he can sing). The film cast was brought over wholesale from the London and New York stage productions. One note: You may not have meant to imply that Hytner, who directed, wrote the screenplay for this, but you do leave that impression. 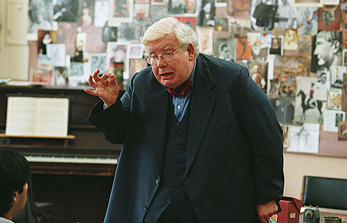 Alan Bennett is credited with the screenplay for this film and for The Madness of King George. Thanks for your endorsement, and for your writing tip. The latter is always especially appreciated. I had the great luck to see ‘History Boys’ on stage. You’re right; the movie isn’t the equal of the performance I saw. I suspect Griffiths magnetism didn’t translate to film. At least the films and TV series I’ve seen. (I have ‘Withnal’ in my to be watched stack.) Seeing Griffiths in a short, minor play, ‘Heroes’, was simply overwhelming. I mourn his passing. Johann, I just ordered it from the library.